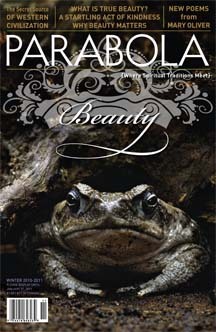 Although I generally love all issues of Parabola Magazine, some really stand out. There's some kind of ineffable promise in the announced topic of forthcoming issues, usually just a single word: Love, Tarot, War. It's the understatement and simplicity mixed with the epic loaded, archetypal themes themselves. Way to take it all on, Parabola. I love that. Because of its decades-long printing history, with each new issue, I am floored that the particular chosen theme has not been used previously. The current issue is a great one. Its theme: Beauty. Flipping through it initially, I found a photograph of landscape that I recognized immediately—an unmistakable Salt Flats scene between Salt Lake City and Wendover, Nevada. Accompanying the author's lovely photo is a very engaging essay entitled Distant Beauty, by Richard Whittaker. Whittaker describes an experience which took place as he drove to Salt Lake along the infamous stretch of I-80, through the Bonneville Salt Flats. Almost everyone I know in Utah has their own story about this same unique desertstretch. Nothing too strange, they're mostly aligned with the spirit of Whittaker's own: a sense of mistaken, strange, or unexpected perceptions, leading to uncharacteristic fanciful conclusions or suppositions. There are likely simple explanations for these ideas: especially at night, the landscape there merges together and is very disorienting. The first time I took that trip on I-80 I thought the highway had become a barely-emergent bridge along what had to be a flooded Great Salt Lake. Of course, there was no water for miles, but it's what I perceived. If it sounds crazy, you haven't been on that road at night. In Whittaker's case, he spied a very distant, magical-looking, impossible-city-kind-of-thing so incongruent that his sensibilities were temporarily sidetracked in a fairy tale-like reverie. Of course, it was probably some horrible processing facility for Morton Salt or some dreadful, godforsaken industrial refinery and it's a very good thing Whittaker didn't just follow the pretty lights. Since reading that story though, I've been thinking about this idea of enchantment quite a bit. It's akin to a small scale, Patrick Harpur style Daimonic Reality episode, I think. Although being roadslapped such as Whittaker likely was suggests an induced mild trance state is at work, I'm not sure it's necessarily so easy to explain away. I have had many experiences that seem to have been truly, literally "enchanted," like I stepped right into magic. Sometimes the sense is broken when reason and explanation come all at once but sometimes the spell lingers and I'm left with the sense of the Otherworld. When I was about 18, my mother held a garage sale. I had taken her spot behind the card table while she took a break. Sitting alone, I was absentmindedly fidgeting with an earring I had made out of a small crucifix I had purchased a few days prior at a vintage clothing/junque store place I worked. The cross was quite kitschy-fancy and intricate and had a little clear, smooth jewel in the center. Sitting there bored at the card table, for some reason I held this jewel extremely close to my eye—it looked like a teeny tiny snow globe or some kind of futuristic domed portal—that's what initially drew me to it out of the zillions of similar pieces of vintage baubles I came across daily. Looking into the jewel at first, I thought I was seeing nearby objects refracted or changed somehow through the glass, although the back of the jewel was backed in a metal setting. Realizing it was odd, I moved it around in different light, distances and angles, and continued trying to discern the shapes I was seeing inside. Pretty soon I started making out letters, then realized there was an entire message inside the crucifix. I can barely describe the unusual feeling I had as this discovery was unfolding—that I had ventured into something secret, hidden, and meaningful, truly occult. It was an altered, almost euphoric magical sense—which was completely deflated and lost upon finding out the mundane truth. Although this all sounds pretty nutty and paranoid/diagnosable, it turns out that I had unknowingly purchased a fairly common type of cross with the Lord's Prayer printed in miniature and fitted under a small magnifying glass jewel. I've also had experiences that never did have that rush back to reality and remain isolated vignettes of wonder. I'll relate one that I've only just begun getting some perspective on in the last few days after reading the Parabola essay and considering the idea of encounters with enchantment. When I was 22 I was going through a huge lifestyle and personal transformation. I had extracted myself from one extreme social dynamic and thrown myself into something equally extreme but completely opposite socially—I had just become a member or the LDS (Mormon) church and was planning on moving to Salt Lake City within a few months. I had just decided to move out of my first apartment--a beautiful and inexpensive apartment in a gigantic Victorian mansion, that I loved. It had become uninhabitable due to the drug dealing neighbors, freerange pit bulls, and a crazed alcoholic landlord. My grandmother invited me to live with her until I moved to Utah and I was in the process of moving my things there but in a kind of limbo land of residence sleeping between my apartment, my parent's house and my grandmother's house—all this on top of having only a temporary apartment arrangement for the upcoming summer with my sister at BYU student housing in Provo. There was a real sense of being ungrounded and without a plan and although I was young enough to just keep going through with it without worrying too much, I look back now and realize I did have a lot of repressed anxiety about it. One day I was driving home from work and saw a "for rent" sign in front of a big house that I'd always admired. I pulled over to get a better look at the sign to see if it had any information. I wasn't looking for an apartment because I only had about three months left in Topeka, but I really just wanted to see the inside of the house. I noticed a woman carrying stuff out of the apartment; she looked approachable, so I got out and asked if I could take a look at the place. She was very accommodating and allowed me to look at the apartment and answered some general questions about it. I stepped in to that place and my world changed. Not just for a moment, and I don't mean it in a cliché sense. I had never imagined that a place like this could exist. I had seen some things by that point in my life—just trust me when I say I had known very interesting people; I had traveled somewhat; I wasn't a wide-eyed babe in the woods. This apartment seemed to be a custom made dreamland for me. It was everything I loved aesthetically but magnified a billion times. But it was more than that and beyond the superficial items—it was as if this space was somehow alive. In the very first episode of Star Trek TNG, titled "Encounter at Farpoint," the crew finds that Farpoint Station is extremely accommodating—what they wish for appears, but not in so obvious a way—it appears organic and just very convenient at first. That's what this apartment felt like—as if it was all unfolding as I was walking through it—like it was blooming into itself after scanning my innermost fancies. It seemed to be some kind of communion. The ceilings were insanely tall—probably 15 feet. In comparison, the rooms were small but in no way cramped, giving it a very non-Topeka feeling. There were beautiful and ancient looking hardwood floors with knots present—I remember thinking the floor seemed to be an actual tree. The walls were painted with mossy greens, French blues, greys and violets from other eras, fading strategically into the ancient wallpaper remnant areas underneath, showing off old roses, faded frills and scrolls. There was one entire wall of nothing but cracked plaster flashing ancient brick underneath—and it was not in disrepair; no, this was a masterpiece. Enormous palm type plants in ornate antique vessels that looked like urns, Edwardian era throw rugs, a claw foot bathtub—and the claws were clutching huge, glowing crystal knobs. A bay window with glass work, an antique curved black couch with carved woodwork of a fox and entire forest scene as the central backing. There was a fireplace with what I thought were molten glass, swirled style burnt orange and reddish tiles, and the most ornate mantle I've ever seen in my life in person. Chandeliers in every room. I could go on, but it's going to further the notion that this was about me liking the furnishings and style. I did, but it was more than that. Every bit of it, no matter how closely I seemed to look at anything, got more and more detailed, more and more baroque, more interesting*. It seemed fractal. Enchanted. I know what it really was—it just happened to be one damn cool apartment, perhaps inhabited by some kind of eccentric, gay, 300 year old fortune teller from the Old Country. Or perhaps just a lucky mish-mash of furnished apartment accident I happened to appreciate. That's got to be it. The woman cleaning it thought the apartment was weird and said the landlord was having carpet installed, having it painted, etc. the following day. I made this ridiculous hasty decision on the spot to live there of course, asked her if she thought the landlord could be persuaded to forgo these modifications and be willing to rent it for only a few months. She didn't think so. Clearly, this just wasn't going to work out for me or the landlord. I ended up living with my grandmother for a few months. The enchantment feeling has stayed with me, and although I can rationalize it like I did above, I'm not really sure about everything I saw, everything I remember. There's something very liminal about the whole thing and it stands as some kind of yardstick of meaning—for what I'm not sure yet. It's certainly not coincidental that it happened at what was a (perhaps the) turning point in my life, a point that was both very empty and very full—very liminal itself. I'm interested in collecting some similar stories of enchanted episodes for future columns—please email me if you have something to share. *There is a line in the film Interview with the Vampire that killed me. After Lestat turns Louis into a vampire, he has some sadistic fun showing him the vampire ropes. "Use your vampire eyes," Lestat tells Louis, and then everything turns and is alive and enchanted. I think this struck me because it's a perfect analogy for certain kind of moments of enchantment—the scene fairly captured the sense of what it feels like to step into such moments.